We have just celebrated Easter Sunday and are beginning to look forward to summer. Looking back at the past month, this is typically the busiest time of the year for our council. Our Fry-Day Fish dinners have been more popular than ever thanks to your hard work and welcoming spirit. This is the biggest fundraiser for our council charities. I especially want to thank Ray and Lorri Coughlin and Rick Okerhjelm who put in countless hours for our six fish Fri-Days! It would be impossible to list everyone who helped out, so I will list most of the tasks and you will begin to understand that we had a total team effort to accomplish these events: Purchasing the food and supplies; on Tuesday evening, we began to thaw the fish on trays in the refrigerators; mac & cheese and coleslaw prep started around 7am every Friday; also, dining room table set up, carry out, beverage, cake and order tables. In the kitchen, we needed to pull out the oven after making the mac & cheese, set up the fryers, butterfly the fish for the grill and the rest of the kitchen prep for cooking. Then we have the actual event of cooking and serving from 4 to 7. We are averaging around 500 dinners in these 3 hours! After 7pm, we start the clean-up. The dining room area needs to done by 8pm, but we also have a crew who stays until about 9pm every Friday to finish the dishes, kitchen cleanup and take out the garbage. Thank you everyone for your help and support! We had our charity poker event in early April over four evenings from 7pm to 2am at Ciccarelli’s. Thank you Hank who chaired the event and worked each night! Thank you also to, Stan Labuda and William Hill who worked two nights and to Larry Bukowski, Ralph Pullis and John Moceri who each worked one evening. Thank you, Ray Coughlin who handled the finances. Well done! Next tournament is in September also at Ciccarelli’s. Our annual Easter Egg hunt went very well. We had a good turnout (~80 Children) and nice weather. Thank you to Rich & Lisa Miller/Ray & Lorri Coughlin for chairing the event, Bill Giezyng (Easter Bunny) and to everyone who helped! Thank you to Jerry Hund for chairing the Easter Ham and Kielbasa fundraiser again this year and to all those who helped with the two order weekends after Masses and those who helped with the unloading and distribution before Easter. Thank you to Co-Chairs John Minicuci, Ray and Sheryl Ignatowski and all the council members and their families for their contribution to our Annual MIDrive (Tootsie Roll). This is a very worthy cause for those with intellectual and developmental disabilities in our community. The first round of nominations for council officers took place at our April meeting. The second round of nominations and elections will be at our May council meeting. The April nominations were: Grand Knight: Mike Hartel; Deputy Grand Knight: Tom Gray; Chancellor: Steve Kargenian; Recorder: Rob Tusset; Treasurer: Ray Coughlin; Warden: Tony Guido & William Hill; Inside Guard: Leon Berdy & Kevin Kennedy; Outside Guard: Gerry Vento; Advocate: Ken Krause & Dave Wisneski; Trustee: Rick Okerhjelm, Tom Pardo & Ken Krause. I just received a notice from the family of BK Giuseppe Riera. Giuseppe was called home by the Lord on January 21, 2019. Giuseppe was a Knight for over 46 years! Please include BK Giuseppe in your prayers. As we enter the last week of October, our council is in the final preparations for our 6th Annual Trunk or Treat. Our Youth Director Art Krygowski and his wife Janice along with Ray and Lori Coughlin do much of the planning and coordination for this big council event. Thank you! Our council was very busy during the month of October. We started out the month with a few Knights helping to move hundreds of cases of books at the Macomb County Library across the street from church. This was to help the library prepare for their annual fall book sale. I would like to especially thank Leon Berdy and George Schulte who did much of the heavy lifting. Ken Krause mentioned that the library and staff were very appreciative of the Knights help. The next October event we had, was a successful euchre party. Forty four players participated and raised $120 for Abigayle Ministries! Thank you! A big thank you also to Ted and Sherri Czarny and my wife Karla for helping the card games run smoothly! Next euchre party is scheduled for January 26, 2019. We had our Fall Pancake Breakfast in mid-October. The council served delicious pancakes, French toast, eggs and sausage. Proceeds will go to St. John MCREST which is one of the charities we are participating in again this November. Thank you to Steve Kargenian for chairing the pancake breakfast and everyone that helped Steve picking up supplies, setting up, cooking, serving, cleaning up and to those who attended. It really is good to see so many pitching in to help! Well done! The next pancake breakfast is scheduled for February 10, 2019. We also had our fall road clean-up along Canal Road from church to Garfield Road. Ten brother Knights helped our event chairman Greg Csernai who needed Rick Okerhjelm to fill in as chairman for Greg on Saturday. We were done in about an hour and a half. Thank you to Bruce Arnold, Ray Coughlin, Steve D’Onofrio, Tom Gray, Tony Guido, Jim Perreault, Ralph Pullis, Craig Thompson and Mike Hartel for helping Rick on Saturday. We could use some additional help next time. Note, you do not require Protecting God’s Children for this event. Moving on to November, for anyone who has not taken the Protecting God’s Children class, two classes are coming up early this month. The first one is right here at St. Paul of Tarsus on Saturday November 3rd at 9am. Please refer to the more comprehensive list in this newsletter. Remember, you must take this class to help out at many of our council events. If you have children or grandchildren, there is still time to sign up for the District Free Throw Contest on Saturday November 10th 10:00 am (St Clement of Rome - Romeo). Please contact our Youth Director Art Krygowski for more information. I would like to thank Leonard Gutkowski for his many years of service for raising and lowering the American flag for the parish on the church flagpole. Leonard has advised he is slowing down and is retiring from these duties. Please contact me if you are interested in taking over this volunteer position. Note that the meal for our November General Meeting is scheduled to start at 6pm due to the Admissions Degree. Sweatshirts (with or without logos): Sizes L, XL, XXL, XXXL, and XXXXL In a box marked boy or girl and size. Bath baskets (1 gallon plastic bag) Dollar store bath room items with max $10.00 limit. Please bring these items to the November meeting, and our District Deputy will deliver to Lansing at the Winter Meeting. Jeff Gapczynski is taking reservations for the upcoming annual casino trip. Please see the newsletter article and flyer for additional information. Please provide your support to John Minicuci, who has volunteered to help Joe Roehrig and Ray Ignatowski with our Spring MI Drive! Our next Corporate Communion will actually be a District Corporate Communion on November 18th at the 11:30am Mass. The council is also sponsoring coffee and donuts after the Mass! During the week of Thanksgiving we will be helping at St. John for MCREST. Please see the article by our chairman Ray Coughlin for additional information. Please consider volunteering to help for this very worthy cause to help those in our community who are in need at this time! With the support of Father Jerry, Deacon Marc and the Worship Committee, we are going to reintroduce presentation of the Holy Family Statue at Mass in support of Vocations. The purpose of the program is to help promote Vocations with a show of public support and to help remind us to keep vocations in our daily prayers. There will be a sign up binder placed in the gathering space for parishioners to sign up to receive the statue. We plan to begin with a monthly presentation of the statue initially. The kick off date will be during Advent. The presentation frequency will be adjusted depending upon parish participation. Please consider signing up for receiving the Holy Family Statue to help get the program off to a good start. Look for more information in upcoming church bulletins. As we begin to prepare for the hustle and bustle of the upcoming holiday season, let us remember to Keep Christ in Christmas! If you need a new Keep Christ in Christmas lawn sign or button, we will have some available during our Ham and Kielbasa order dates after Mass. Also, look for our district sponsored “Keep Christ in Christmas” sign on the electronic billboard along M53 at 29 Mile from Thanksgiving through Christmas. Please welcome our newest Brother Knight, Richard Motta to our council. Richard became our latest council member by taking his Admission (1st) Degree at St. Lawrence on September 13th. Also, please welcome two Brother Knights, David Wisnewski and Michael Mitrowski, who have transferred to our council. This past month was a difficult month for our council. The Lord took home Three Brother Knights from our council alone. Brothers Bill Gowland, Thomas Hayes and Tony Valentine were called home by the Lord. Please remember to keep them and their families in your prayers. A total of seven Brother Knights from our council will be honored with a Memorial Mass hosted by the Knights of Columbus Detroit Archdiocesan Vocation League (DAVL) at Sacred Heart Major Seminary on November 4th at 10am. This is open to all Knights and their families. If you are interested please let me know by October 22. Thank you to everyone who attended our Corporate Communion in September. We had a nice turnout. Most wore our grey polo shirts. If you need to pick up a grey polo be sure to see Craig Thompson. Our next Corporate Communion will actually be a District Corporate Communion on November 18th at the 11:30am Mass. The council is also sponsoring coffee and donuts after the Mass! There were over 100 golfers who participated in the September DAVL Golf Outing at Sycamore Hills. I counted at least a dozen golfers from our council. The weather was a little refreshing. However, no rain gear was needed! Thank you for supporting vocations! Be sure to review the calendar for upcoming October events and sign up at our next General Meeting which just happens to be on Columbus Day! We have Pancake Breakfast, Road Clean-up and Trunk or Treat. The next euchre party is also coming up right away on October 6th. Call me to save a spot. Please welcome our newest Brother Knight, William Pirrami, to our council. 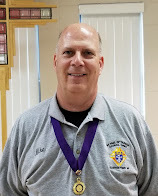 Bill became our latest council member by taking his Admission (1st) Degree at St. John Vianney on August 18th. The annual ice cream social for the parish on the last weekend in July was very popular. The weather was beautiful and the council helped the chairman, Rick Okerhjelm, tremendously. Thank you everyone! Ken D. has placed a nice photo slide show on the council website. I gave Father Jerry the Birthday card the council members signed at our August General Meeting with a gift card for Luigis. He thanked us for all that we do. 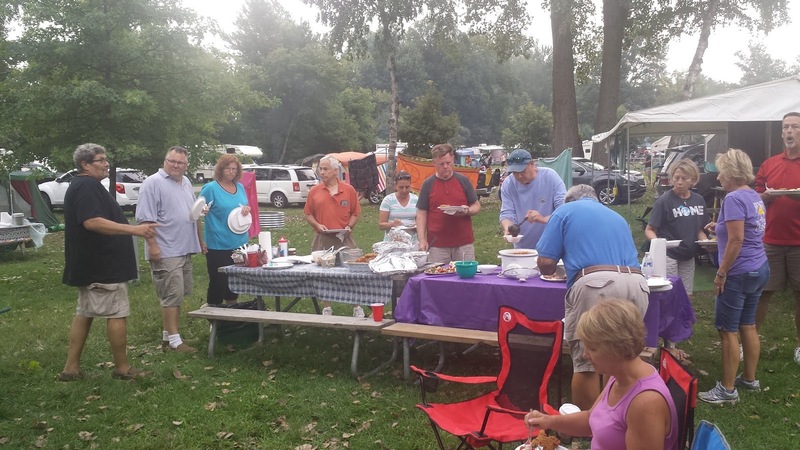 The inaugural council camping trip at Lakeport State Park in August was very nice. We had nice weather, Lake Huron was perfect for swimming, the campfires and social time was excellent. We had a total of about a dozen campers on six separate campsites. Good food, along with a few visitors and some nice weather made for a wonderful Saturday evening pot luck dinner. We are starting to plan for next year already and are targeting the weekend before the Dream Cruise in August 2019 with the same venue. Thank you to everyone who attended the District Corporate Communion and Officer Installation at St. John Vianney. An excellent meal was served by the host council, St. John Vianney, after the ceremonies. Sue Nellis, Executive Director from Compassion Pregnancy, thanked all the councils who helped with the renovation work earlier this year at the Compassion Pregnancy facility, and provided a cake for dessert. Be sure to review the calendar for upcoming September events such as our Corporate Communion, Texas Hold’m (sign-up sheet at our next General Meeting) and the DAVL Golf Outing (See flyer). Note that October is right around the corner with some of our bigger events scheduled such as Pancake Breakfast and Trunk or Treat. The next euchre party is also coming up on October 6th. A sign-up sheet will be available at our next meeting. Please note that we had 56 players at the last party. Capacity is 60 players. So save yourself a spot and sign up early. A notice to the parish for euchre will be placed in the September 23rd and 30th church bulletins.